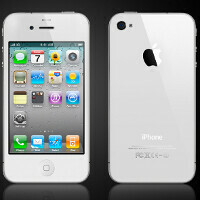 White iPhone 4 to be launched on April 26? In the last few weeks a lot of rumors concerning the white version of the iPhone 4 have been published, and you know something is in motion when a few respectable sources - like Bloomberg, WSJ and Reuters - have claimed that this mythical version of the latest iPhone is to be released very soon. Now a source coming from Italy claims that the white iPhone 4 will be launched in this country on April 26, which is only 8 days from now! If this rumor comes true, it seems practically certain that we will see this handset around the same time in the US and other parts of the world - after all, it seems highly unlikely that this phone will see an exclusive release in Italy and nowhere else. It's just a demonstration of the iPhone craze that a device, which - at the risk of stating the bloody obvious - is nothing more but an iPhone 4 painted in white is creating headlines around the world, and is much anticipated by plenty of people, not to mention that Apple seems to believe it will sell well - otherwise, why bother to release it at all? This piece of information gives fuel to the report that the next-gen iPhone will be launched in very late 2011 or early 2012, as it seems unlikely that we will see the release of two iPhones within a few months of each other. It's said that the white iPhone 4 will be available for both AT&T and Verizon in the US. Let's hope they manage to fix the ability to send MMS' by then..
don't worry about fixing important features... lets release another color! Who cares anymore. The shell color is redundant and waaaay over due. The only news i4 has really had is the continued hopes of the white coming out. the white is not a tech advancement, it is the most basic element of designing a phone. i mean, Michelangelo painted the ceiling of the Sistine Chapel... Can Jobs not get this right???? Who cares? Depends who you are. Most of the US does not run in the tech/nerdy circles that we do. My friend is a shmo when it comes to tech. They can't wait for the white color. Where you and I see the same device with a new coat of paint, others see a reason to get the new iPhone. Remember the different colored Nintendo game cubes? It's all about personalization. iPhone 5 will be released the day after.